Nestled under the trees and just minutes from the white sandy beaches is the North Myrtle Beach resort of Ocean Creek Lodges 2. This North Myrtle Beach condo complex is part of the Ocean Creek Resort, which is a gated North Myrtle Beach resort that covers a tremendous amount of ground in the Windy Hill section of North Myrtle Beach, South Carolina. Ocean Creek Resort has a beautiful stretch of beachfront, convenient golf cart paths and a wide variety of recreational amenities scattered throughout the property. So while you will enjoy a quiet retreat at Ocean Creek Lodges 2, a North Myrtle Beach resort tucked into the woods, your family will be just a short walk away from the oceanfront. Ocean Creek Lodges 2 is a North Myrtle Beach resort that features an indoor swimming pool and whirlpool. Centrally located, the swimming pool is easy to reach from both ends of this North Myrtle Beach resort. There are a couple of elevators that can whisk you down to the ground level where a quick swim might be on your North Myrtle Beach vacation agenda. Ocean Creek Lodges 2 is only a four-story building. Each of the North Myrtle Beach rentals at this North Myrtle Beach resort have a private balcony so you can be outside while being just steps away from the living room of your North Myrtle Beach condominium. Enjoy all of the amenities found at Ocean Creek Resort, including the oceanfront swimming pool. Beautifully landscaped with palm trees, this sparkling swimming pool is a crystal blue and it is surrounded by chaise lounge chairs. Relax in the sun with the sound of crashing waves tickling your ears. Slip into this oceanfront swimming pool when you need to cool off a bit. 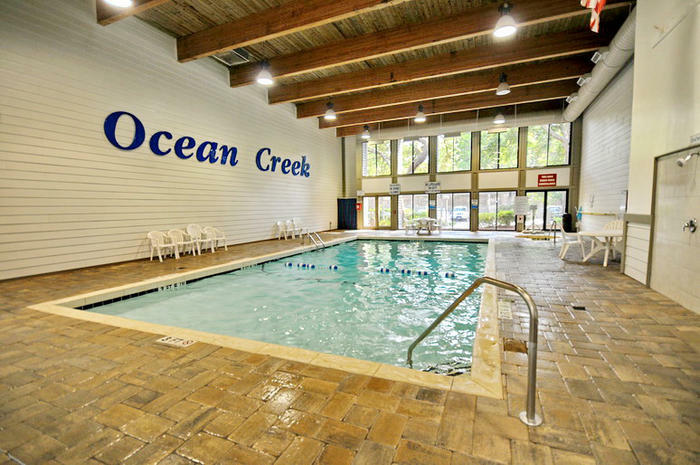 The indoor/outdoor swimming pool at Ocean Creek Resort is on the oceanfront. Swimmers just have to go underneath a glass wall to go from inside to outside in this innovative swimming pool. The sun decks are so inviting and as guests of Ocean Creek Lodges 2 you are welcome to enjoy time on the sun decks and pool decks found throughout this North Myrtle Beach resort property. Beach volleyball is quintessential vacation fun. Ocean Creek has a beach volleyball court set up in the sand. Get your team together and lob the ball back and forth over the net as you get a great suntan. Next to this sand volleyball court is the playground. Swings, slides and plenty of things to climb make this playground fun for many ages. There are also tennis courts at Ocean Creek Resort. The blue tennis courts are lighted to maximize the times when you can play. Getting in some exercise during your North Myrtle Beach vacation is easy when there are so many ways to recreate found right on site at this North Myrtle Beach resort. Elliott Beach Rentals is not affiliated with onsite management or the HOA of Ocean Creek Lodges 2.